Humanity Healing International has partnered with Future Victory School, FVS, a private educational institution, licensed by the Ministry of Education and Sports. It was established in the year 2000 as a response to an avalanche of orphans created by AIDS and the Civil War in Uganda. Currently, there are 320 students enrolled, 150 of which are orphans, 10 are HIV+, and 4 are disabled. HHI both sponsors FVS and utilizes the school to optimize pilot programs being developed before rippling them out across sub-Saharan Africa. Future Victory School has a physical location of Bugaya Zone, LC1, Kiwungu Village, Butansi Sub-county, Bugabula County, Kamuli District, Eastern Uganda, East Africa. Primary, P1-P7: Students enter P1 at 6 years of age. This is the upper limit of guaranteed public education in Uganda. If a child has funds, they can enroll in Secondary School, also referred to as High School or College. The long-term goal of HHI at FVS is to build and expand the educational program to include Secondary Education, S1-S4, on the grounds. 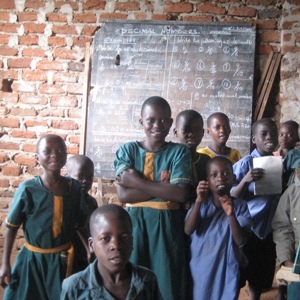 The opportunities for orphaned children to receive an education higher than P7 are very rare. The creation of a Secondary School would provide an unheard of opportunity for these orphaned and economically disadvantaged children. The children at Future Victory School need your help to realize their full potential. Donate to one of the Projects at FVS. Sponsor a child at FVS. The cost to sponsor a child at FVS is $30 per month. This will cover the cost of Food, Medical Care, Housing, School Uniform and Shoes, and School Supplies. Sponsor a Classroom. If you are a teacher or educational professional, connect your school or classroom to one of the classes at FVS to create an opportunity for the children to learn about the lives and culture of the other. This is also a wonderful opportunity to teach service to others.